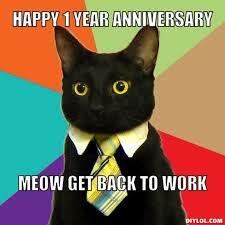 I’ve been a part of the corporate world for exactly a year now. The weird thing is it feels like I’ve been here forever! I assume that’s a good thing, but I suppose that depends on who you’re talking to. Some of you already know, I spent seven years at one place and it was a much different atmosphere than where I am now so I’ve made it a point to celebrate some small victories, even if I just celebrated them with myself, to help me adjust to a different environment. Not to say that it’s been a hard adjustment (really it has been), but to say that when you get used to certain things it is hard to adjust to something completely opposite. So, what are some of the small things I’ve celebrated? I got comfortable enough to give up my back up job of waiting tables/bartending. I feel like my immediate manager has my best professional development interest at heart (at times it was questionable, but one day he said exactly what I needed to know and it was 100% genuine, it immediately increased my loyalty. Seriously, on the spot). I’ve survived my first year of on-campus college recruiting. I’ve survived two EDPs (employee development plan)-this type of thing was absolutely unheard of at the previously mentioned job, so I still get nervous about sitting down with my manager and telling him my goals. I’m not fully convinced there isn’t some strings attached to this deal, so YES this is a big deal for me. I also survived my first performance review. My co-workers and boss rocked my birthday month like some kind of crazy birthday month pros. I have an awesome work-out buddy from work. I’ve learned some new phrases, some of them only unique to Rick, otherwise known as Rick-isms. I’m getting closer to not letting it intimidate me that I’m not the smartest person in the room, most of the time, at this job. This list could probably go on for at least a few more items. I was just as intimated as any new employee when I showed up for my first day. My office mate at the time helped ease my concerns and the fact that the whole department did their part to embrace me went a long way as well. Switching jobs can be tough for anyone. Your always tempted to say “at my old job we did it this way” or to compare your current workload to a workload at a previous job (yes I’m guilty of both), but your new co-workers probably don’t want to hear it. It’s important to know that it is just as much the new employees job to engage with the group and show some commitment as it is the existing employees job to embrace the newbie. So in summary: I’ve survived a year with them and they’ve survived a year with me 🙂 Employers, be sure and have a good mentor, sponsor, whatever you want to call it type program to acquaint your new employees with your work environment-even the most experienced professional needs to learn their way around the new digs (physically and mentally). Job seekers: keep your chin up and don’t alienate yourself, when the time comes take responsibility for integrating yourself into the new group! Next Next post: This ain’t your Grandma’s Easter..